TechNed Benelux has many years of experience in developing and manufacturing high-quality, explosion-proof products for use in adverse conditions where maintenance is not only expensive but also a safety hazard (e.g. climbing, electrocution, injury). It is our mission to contribute towards the growing awareness of environmental issues through 100% recycling, reduction of CO2 emissions, energy savings and reducing light pollution. We take the problems of customers and provide the solutions. It is our belief that the market is not only looking for suppliers, but also for partners. All explosion-proof products are certified for use in Zone (2)1 and (2)2 by regulator bodies, enabling users to have safe working environment and reliable installations in hazardous locations. 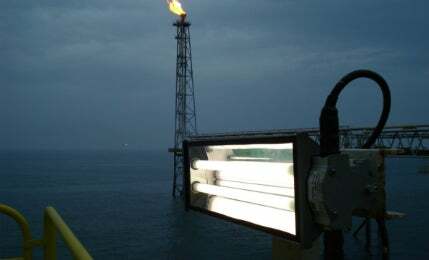 Our stainless steel floodlight with xenon lamp is certified in accordance with ATEX and IECeX. In addition, it is in accordance with CAP437 helideck guidelines for most applied standards for offshore installation and vessels. The luminaires are equipped with a multi-voltage ballast, which ensures a wide range of voltages. Our obstruction lighting is in accordance with the relevant ICAO guidelines, ranging from low-intensity up to high-intensity. All versions are based on an LED light source. Cereal Docks is a 100% Italian company, which operates within the national market since 1983 collecting, processing and transforming agricultural raw materials into goods valuable for the feed and the food industry. Cereal Docks is a link between the farmers and the agri-food industry. This white paper outlines the characteristics, features, general and technical specifications for the TNAML® luminaire. TechNed Benelux BV puts its own series of Ex-brass nickel plated cable glands on the market, Type TB-P, with ATEX and IECEx Certificate. 2016 is now well on the way and the prospects are more interesting than ever. For this year, we have high expectations and the first projects have already been awarded to us.